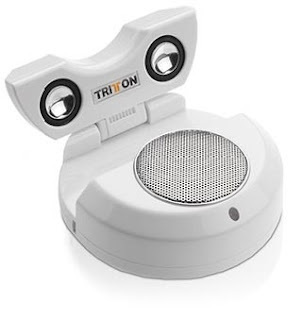 Sound Bite music system which is designed unique and portable by Tritton, the USB portable 2.1 speaker system delivers an unbelievable quality of sound across the entire musical spectrum in a compact design. With a built-in subwoofer, you will enjoy the highs and lows as they were meant to be heard. Both the audio and power come from the single attached foldaway USB cable so there are no batteries, power adapter or cables to carry around.